Summer is more fun in the Philippines but not to boys who are scheduled to have their required circumcision. 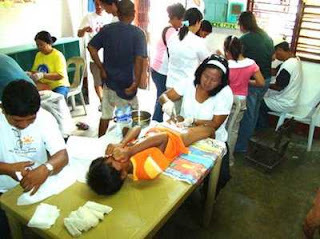 My 9 - year - old kid was all set to have his circumcision along with hundreds of boys in Zamboanga City. We had to tag along with his cousin and friend to boost his confidence but to no avail when his turn was up that he had to wail profusely requiring us to suspend his passage - to - manhood ritual. Circumcision is a thing of pride among boys and for those who are still uncircumcised face the harsh tease and social pressure that it becomes a source of depression and insecurity. There are however prevailing myths that circumcision shall prevent the risks of paralysis, epilepsy, insanity and practice of masturbation. What are these benefits and what are the data to back them up? Prevention of urinary tract infection. Circumcision reduces the incidence in infants boys by up to 10-fold, but it is only a reduction of 1 percent to 0.1 percent. The resulting benefit is not thought to continue at older ages. Prevention of penile cancer. Essentially only uncircumcised men develop this cancer but it is exceeding rare with only 1,500 new cases yearly in the U.S.
Prevention of sexually transmitted diseases (STDs). Earlier reports of circumcision preventing common STDs such as gonorrhea and syphilis have not held up to scrutiny. Several recent reports from Africa have shown a 50 percent reduction in new HIV infections in adult men undergoing circumcision, but the relevance of this data to infant circumcision in the U.S. -- which has a much lower prevalence of HIV -- is unknown. Prevention of problems that may require circumcision at a later age. Little data exists of the need for circumcision at an older age due to infection beneath the foreskin (balanitis) or inability to retract the foreskin (phimosis), but the highest estimates are 10 percent. While debate continues whether circumcision is indeed required, medical practitioners highly recommend that circumcision shall be given to boys age 7 - 12 years old for hygiene and medical reasons. As parent of a boy, I am anxious of the procedure but the health benefits simply outweigh this anxiety, however, I must prepare my kid mentally for this ordeal and acquiring a health service of a more sympathetic circumcision surgeon is more we need.